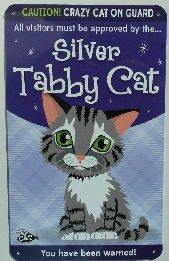 This little sign says that all visitors must by approved by the silver tabby cat. The tin sign is 5 1/4" wide x 8 5/8" high. Holes in the four corners for easy mounting. New.